Movie: "Mamma Mia! Here We Go Again"
As a memorial to her mother, Sophie has renovated her mom's hotel, renamed the Hotel Bella Donna, and plans to reopen it after holding an opening night party, all while she learns about the summer her mother met her fathers. 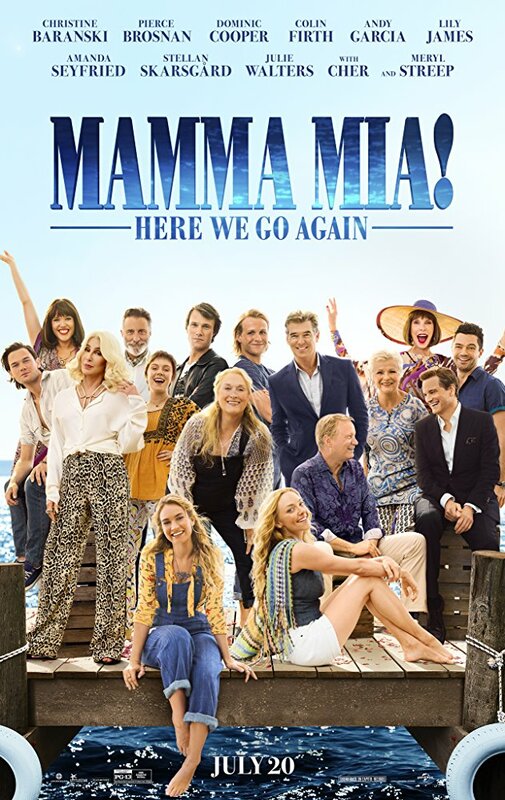 They should probably re-title this film "Mamma Mia! : Here are the B-Side Tracks." But hey, Cher gets to sing "Fernando," so there's that! "Mamma Mia! 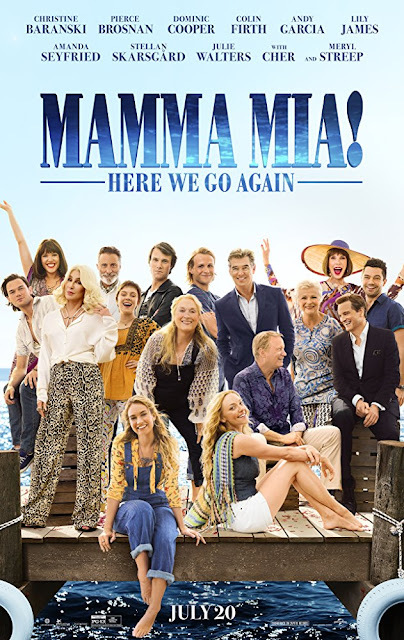 : Here We Go Again" is directed by Ol Parker, who has directed films like "Imagine Me & You" and "Now is Good," but is probably best known as the writer of "The Best Exotic Marigold Hotel." Parker also helped write this story along with Richard Curtis and Catherine Johnson. This movie picks up five years after the original. Donna (Meryl Streep) has passed away. To honor her mother, Sophie (Amanda Seyfried) has renovated and plans to re-open her mom's hotel, now called the Hotel Bella Donna. She is going to throw a big grand reopening celebration with lots of rich people and press to garner attention for their little hotel. Unfortunately, bad weather puts the whole party in jeopardy. Meanwhile, Sophie learns the history about the summer she was conceived and her mother's (Lily James) romantic rendezvous with the three men who could be her father, Sam (Jeremy Irvine), Harry (Hugh Skinner), and Bill (Josh Dylan). 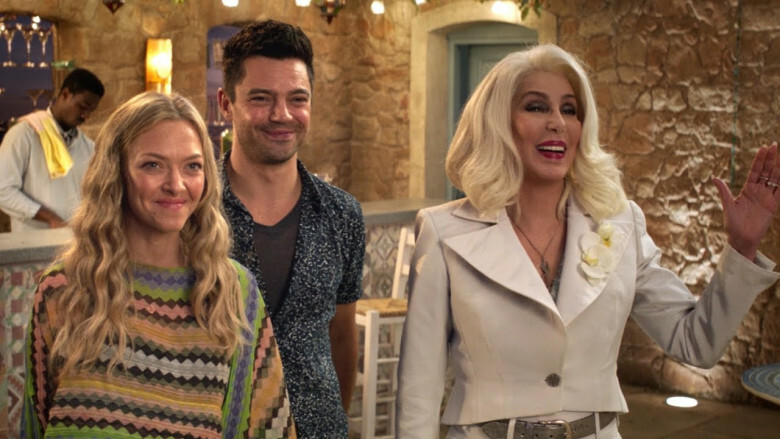 Despite all its flaws and sheer absurdity, we are big fans of the original "Mamma Mia!" We were also really looking forward to this sequel, so you can't imagine our disappointment when this turned out to be a completely bland slog of a musical. We technically already know the story of when Donna met Bill, Sam, and Harry, it's all laid out in the song "Our Last Summer," which was included in the first film. Now, we are just watching it all play out in flashback form with no new surprises. Everything that takes place in the present is new and (can be) interesting, but any time the film has a flashback to young Donna, the whole ordeal drags to a screeching halt. Also, though consistency and clean, clear timelines have never been the strong point of "Mamma Mia!," there are a couple of inconsistencies that plagued our viewing experiences and irked us all the more. For some reason, many of the details mentioned in the original story no longer apply to the prequel. When Sam meets Donna, he still has his life lined up for him, but he is no longer a hippie with long hair and stylish headband and looks like any other regular ol' Joe-Schmo. When Harry stumbles upon Donna by chance, apart from a leather jacket in the middle of a Parisian summer, he is no longer a punk rocker. The younger versions of these characters simply mimic their older counterparts to the tee. In the original, Donna's mother Ruby (Cher) was not only a strict, seemingly cruel parent (as discussed many times in the 2008 film), BUT SHE WAS ALSO SUPPOSED TO BE DEAD. Apparently, the solution was to bring her back to life and make her a Vegas singer!?! Sounds like she's super strict if she hasn't been seen in ages and is hiding in the Vegas sun! Most of what happens in this story is a rehash, so we found ourselves mostly bored whenever a flashback occurred. 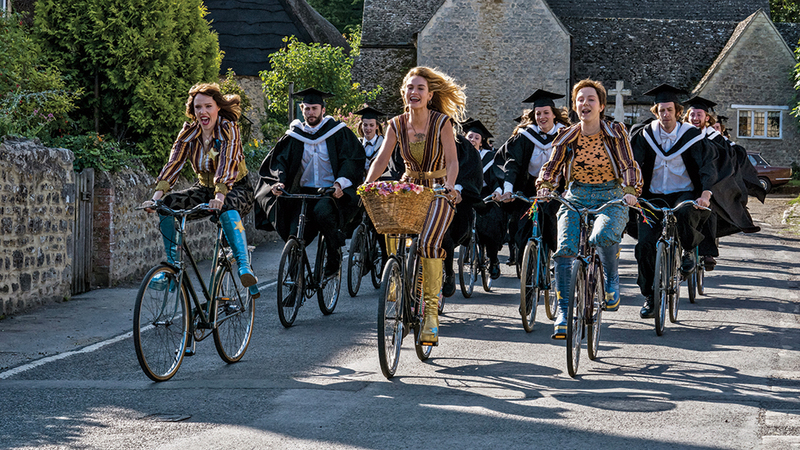 Lily James, Jeremy Irvine, Josh Dylan, Hugh Skinner, Jessica Keenan Wynn, and Alexa Davies are not to blame at all. In fact, most of them put on great performances and have surprisingly good singing voices, but they are just playing copies of their older selves. Trying to backtrack and shove the pieces of this puzzle together where they don't belong made this sequel feel very forced and effortful to us. Nothing feels like it flows naturally. Finally, while I agree with BigJ that the ending felt like an uber-manipulative move on the part of the writers and director to create a cheap, unearned emotional moment, I'd be lying if I said I didn't cry because it's all I wanted from this movie. "Here We Go Again" is not a total loss. It does have its moments of jubilant fun that caused us to infectiously smile. These times mostly come from whenever Christine Baranski and Julie Walters, and their younger counterparts Wynn and Davies, are on screen. The latter two actresses do excellent imitations of their more mature counterparts. Most of the original cast is good, but they aren't on the screen nearly enough to make the film enjoyable overall. In the end, we felt like "Mamma Mia! Here We Go Again" added nothing new to the saga of Donna or Sophie except mediocre b-side tracks and forced interactions to a story that didn't need to be retold. It acts as little more than a series of music videos performed by a cover band, no matter how good that cover band might be. We're really disappointed in this film.